NEMY RIVERA, R.I.P. We are sad to report the passing of our good friend NEMY RIVERA last January 20, 2016. Known as Father of Philippine Christmas Seals, Nemy was instrumental for the Christmas Seals section on our website. His knowledge and enthusiasm kept the hobby alive. We would like to extend our condolence and prayers to his family. Nemy Rivera will be forever remembered. Nemy L. Rivera started collecting stamps early in his adult years, but got fascinated with the colorful seals that appear on mails during the Christmas season much later. Learning where these seals came from, Nemy started frequenting the offices of the Philippine Tuberculosis Society (PTS) in Quezon City. Aside from buying seals, he befriended the Society’s staff, studied its records when permitted to do so, and ended up buying quantities of excess proofs and printer’s waste every so often. To broaden his insight in seal collection, Nemy wrote to a big number of TB societies around the world, about a third of whom answered back, sending information and samples of their country’s seals. But more importantly, a few referred him to prominent seal collectors. Thus Nemy got in contact with Henry Irwin, editor of Seal News of Chicago, and the hall-of-famer worldwide seal collector, Dr. J. M. Offringa of The Netherlands. Both became Nemy’s long time mentors in the hobby. And surprisingly, both were avid collectors of Philippine Christmas seals. Henry Irwin early advised Nemy to secure a copy of Green’s Catalog of the Tuberculosis Seals of the World, and to become a member of the “Christmas Stamps & Charity Seals Society” in order to touch base and interact with advanced seal collectors. Nemy immediately complied. Eventually, he was able to accumulate and mount several complete and comprehensive albums of Philippine Christmas seals. In the early 1980s, The PTS requested Nemy to form a seals committee to advise it on the design, production and marketing of Christmas seals. Nemy invited three prominent philatelists and a paper and printing expert who all agreed to serve in the committee as volunteers. Additional members were recruited from time to time. Nemy has worked closely with the Society in this capacity for the past 22 years. He is credited with the design concept of six seal issues. At age 22, Nemy was a captain in the Philippine Army, integrated from guerrilla service. After mustering out, he went through a series of small and big jobs, including a stint as network supervisor over several radio stations in the Visayas, and sales manager for a small multi-product company operating in the whole of Luzon, in the process developing "momentum and experience". Although a college undergraduate, Nemy later became vice-president of a large advertising agency, and a senior executive / field manager of two leading manufacturing - marketing organizations, one after the other, until his extended retirement at age 72. 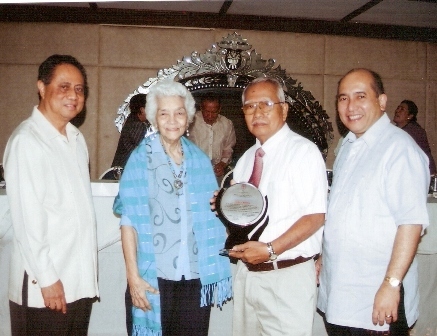 Nemy L. Rivera receiving a plaque of appreciation from Mrs. Zeneida Quezon Avancena, President of the Philippine Tuberculosis Society, Inc., during the launching of the 2008 Christmas Seals of the Philippines.